If it happens, support should come in the form of a future Roku OS update, according to a MacRumors source. In January, a Roku spokesperson said only that the company doesn't "have anything to share regarding this now," hinting that efforts were underway. A partnership between the two companies could go a step further with a native Apple Music app, the source added. Roku devices already have apps for services like Spotify and Pandora, but Apple Music has been slow to come to third-party platforms like Amazon Alexa. During last month's Consumer Electronics Show, Samsung, LG, Vizio and Sony all announced plans to provide AirPlay 2-compatible TVs. Owners will be able to stream photos, audio and video, even asking Siri to push content with commands like "Play 'The Road' in the Living Room." The iOS Home app is being updated for this in iOS 12.2, where people will also be able to switch inputs or power a TV on and off. That software is still in beta. This is great news for Roku, which owns this segment. For me, licensing AirPlay has been one of the more surprising and welcome developments from Apple, and i believe essentially means they've given up pushing their own niche streamer (reports of Apple TV being sold at or below cost are garbage unless you include R&D, in which case name your price). Roku has a close relationship with Netflix, which bailed on getting into the hardware business at the 11th hour. As a service provider who needs the Apple TV platform now more than ever, they walk a fine line between upsetting Apple, and competing with them. Two words, "Platform agnostic." This is the future as the cable model goes bye-bye. And not soon enough for me! I just want an 8K 100" TV for $999 with an AppleTV (one f'ing remote). I'll then search and 'rent' everything from Apple. NetFlix's, Youtube's interfaces are crap and so is 90% oft their respective content. I don't go to the 'Movies' anymore, the experience is appalling with everyone eating their popcorn, soda's and nachos like donkey's. I'd much rather stay at home! P.S. Why do American's insist on eating everything with their fingers? There are never enough forks for the popcorn, are there? Haha! I was referencing the burgers, fries, cheesy fries, pizza, tacos, etc., etc. ...guess it not just America. What's the point of dirtying a plate and/or utensils when they're not needed? Theater workers already have to clean up far more crap than they should. Can you imagine adding plates and forks to the mix? Not to mention if a fork were to be missed, and someone sat on it. I'm perfectly OK with people eating with their fingers. Especially if it upsets or offends someone. 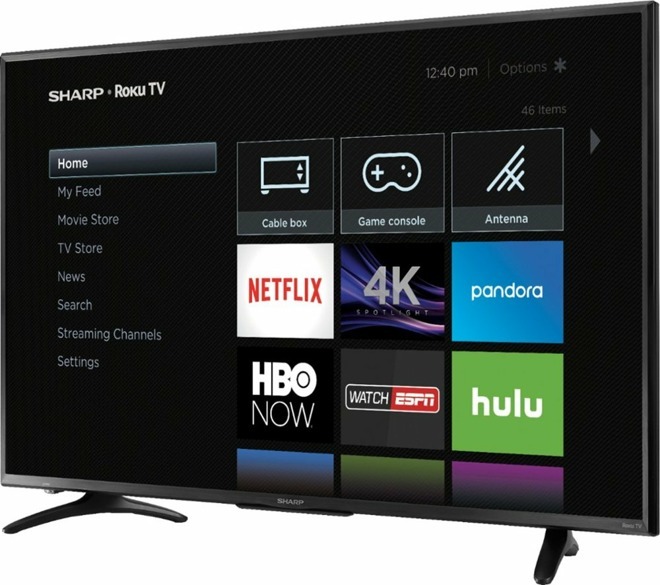 On topic, I was going to purchase a TV this Super Bowl season, but with the announcements out of CES and such, I'm waiting to see what becomes available, unless I can find something I like that will also be upgrade-able later. Apple is going to continue to produce Apple TV as it isn't an "either/or" choice for them. You'll always get a better experience with an Apple TV offering more services and capability, and of course, as more people focus on their TV and other services as really private data vacuums that destroy your privacy, having an Apple TV to protect your privacy will just increase its value. Just like using HomePod to have the best listening experience, leagues better than the cheap, tinny sounding Alexa and Google speakers, that are used for those with Android devices, there is always going to be a market for people who will pay for a quality premium experience. Here's my free killer tip of the day: use a fondue fork to eat cheese puffs. Not only do you keep your hands clean, but you eat slower and get a higher satisfaction:calorie ratio. You have a point. Also: chicken nuggets, fried chicken, chicken wings, ribs, ice cream cones, granola bars, Pop Tarts, chili, sandwiches, breakfast sandwiches, and chips and dip. ... as more people focus on their TV and other services as really private data vacuums that destroy your privacy, having an Apple TV to protect your privacy will just increase its value. Check your settings on your AppleTV then as the defaults Apple chose for you are not necessarily in your best interests from a purely privacy standpoint. I'd bet you've never looked at them. Netflix 'bailing' was a smart business decision. It ensured other services would be on the Roku instead of it being a one trick pony. Roku is already competing with Apple and doing a splendid job at it. Haha...sorry! But are they trying to kill us? I maintain food manufacturers would take ground up old tires, cover them in red dye and sell it as 'Tomato Sauce' if they could get away with it!